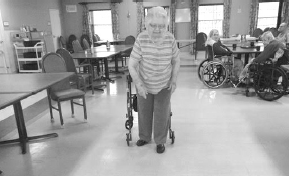 Waldron Nursing Center residents are proud the short lived stomach virus is long gone and everyone is back to full swing with all of the activities. Reminiscence with Diane Miller on Monday morning, Round table with Alex in the afternoon, Temple Baptist group were here for their weekly sing, nail painting, batter ball, Bingo on Wednesday and Friday afternoon. Art work, Red Hat Trivia, Resident Council, morning crafts with Volunteer Pat Morales helping out. Day room fun with Regina. Sip and Chat Social, residents really like to gather early in the dining room to enjoy a nice cup of coffee or a glass of ice cold tea before making their order out for the meal and spend some time socializing with each other while waiting for their meal to arrive. Everyone always enjoy getting to pick what they want to eat for whatever meal from the resident menu’s. It is just like going out to eat and you can have whatever foods that is listed as well as if you want breakfast in the evening or lunch type food for breakfast that is also available. Connie and her staff do a great job of preparing the meals for our residents. The Special activity of the week was “Horse Shoes”’ We have some pretty good throwers when it comes to making “ringers” with the horse shoes. Keeps Alex on his toes. Also the hallways are looking very festive with all of the Easter decorations that Alex and the Housekeeping staff has put up. It doesn’t seem possible that “Spring” is already here and we will be going on the spring outing before too long. “Thanks” goes out to all who have been dropping things by for our bingo cart and other items that are useful for our residents. Our deepest sympathy goes out to the family of Martha Watkins. Martha has been with us for several years and is loved by all who knew her. Our thoughts and prayers will be with the family over the many sad days ahead. Also to the family of James Hunt. Many of us have known James for several years although he was only with us for a short while he will be greatly missed and our thoughts will be with his family as well over the many sad days ahead. In closing we are always appreciative of the items that are dropped off to make life more enjoyable for our residents. Photo: Queen Madge Hunt joins in the “Horse shoe” game.